CITE AS: Flo Laino, "George Dance the Younger," in 100 Minories, January 3, 2015, https://100minories.lparchaeology.com/george-dance-the-younger/ [Date Accessed: April 23, 2019]. Portrait of George Dance the Younger , by George Henry Harlow 1814. Reproduced with the permissions of the National Portrait Gallery. © National Portrait Gallery, London. 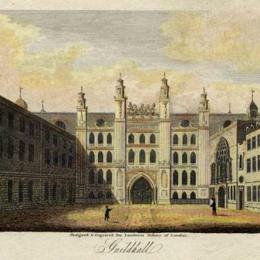 The facade if the Guildhall c.1805. Engraved by E. Shift, after a drawing by Prattent. St Luke’s Hospital, Cripplegate, London: the facade from the east. Coloured aquatint after T. H. Shepherd, 1815. 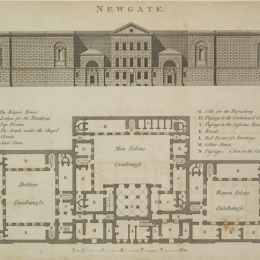 Building plan of Newgate Prison, published in 1800. George Dance (1741 – 1825), is frequently hailed one of the country’s ‘most distinguished architects’ (Stroud 1970, 21). Serving as the Clerk to the City Works in 1768, a position which he took over from his father, to whom he was apprenticed, Dance’s architectural career spanned fifty years from 1765, to his retirement in 1815. Alongside his contemporaries, those such as the Adams Brothers, John Wood the Elder, and Sir John Soane, George Dance may be regarded among the individuals leading London architecture out of the post-Great Fire era, and towards the widespread adoption of the ‘enlightened’ style of the Neo-Classical form, and the ‘planned’ landscape. Dance was a founding member of the first architectural society in Britain, and one of the first Royal Academician-Architects – professionals of the Royal Academy who were Masters in their study, and whose work underscored the practice of architecture as a precise and calculated science, advanced by a series regulations and building standards (such as the 1774 Building Act) formed from the late 17th Century onwards. As the City Surveyor, under the Corporation of London, Dance had a significant impact on the shape of the square mile at a time when London’s speculators (such as Sir Benjamin Hammet at the Crescent, Circus and America Square), were only just beginning to gather a real interest in the huge profits that could be made through the undertaking of ‘development’ in London; a defining feature of Early Modern capitalism. Dance is responsible for a range of architectural works: churches, monuments, several London town houses, as well as public buildings such as theaters, hospitals, asylums. Sadly of the hundred or so buildings that are attributed to him, many have not survived to the modern day, either demolished or rebuilt entirely. 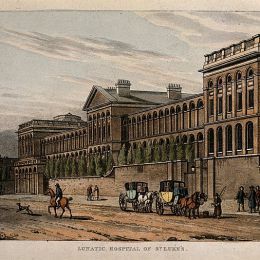 Lost to this fate include examples such as St. Luke’s Hospital for Lunatics, the Shakespeare Gallery in Pall Mall, and the grand Ashburnham Place. Whilst Dance’s style should be considered undoubtedly Palladian in institution, following on from the of Classicism of Wren and Mannerism of Vanbrugh, his legacy also demonstrates a flare for experimentation. Dance’s work shows him on the one hand playing with various Italianate ornamentations and architectural details in the Classical form, and on the other introducing completely alien structures, such as the wildly intricate Hindu-Gothic facade of the Guildhall Library 1785-88, several years before this type of orientalism was to become a popular thread in English architecture. Certainly, Dance’s architectural schemes demonstrate a stateliness of style, however, perhaps more in contrary to our present-day perceptions of the aspiring Georgian Architect, Dance’s time as City Surveyor demonstrates that he was not an individual only concerned with lavishing the stylistic needs of the upper echelons. Indeed, the historiography which surrounds Dance, has awarded him a reputation of bringing the enlightenment style to the middle class, balancing ornamentation with utilitarian design, through implementation of simple brick fabrics, and unabashed use of void and asymmetry. The great legacy of schemes for a wider audience, including residential estates at Finsbury and Minories, and civic work for roads, ports, hospitals and prisons, sets Dance apart as an individual at the core of cross-societal ‘improvement’ in 18th-19th Century London. Brunt, H. (1955). 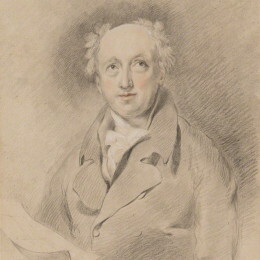 ‘George Dance the Younger, as Town Planner (1766 – 1814)’. Journal of the Society of Architectural Historians, 14, 4, pp. 13 – 22. Bestland, C., after Henry Singleton, published 1802 (1795). ‘Royal Academicians.’ [Stipple engraving]. Available at: http://www.npg.org.uk/collections/search/portraitLarge/mw17170/Royal-Academicians?LinkID=mp01178&search=sas&sText=george+dance&role=sit&rNo=1 [Accessed 20 February 2015]. Image reproduced and modified with the permission of the National Portrait Gallery.